Dr Abdulla Ajaj - a physician who helped administer the vaccine - said the children all exhibited the same 'severe allergic shock' to varying degrees. 'There was shouting and screaming, it was hard for the parents. You get your child vaccinated and then you find your child dying, it's very hard,' Ajaj said. There weren't enough respirators in the clinic, making the situation even worse, he added. Video footage uploaded to social media showed a medic examining a young girl who was squirming. Another child, in an orange tee-shirt and blue pants, appeared lifeless as a medic administered CPR. He then opened the child's mouth to reveal a swollen, blue-tinged tongue. 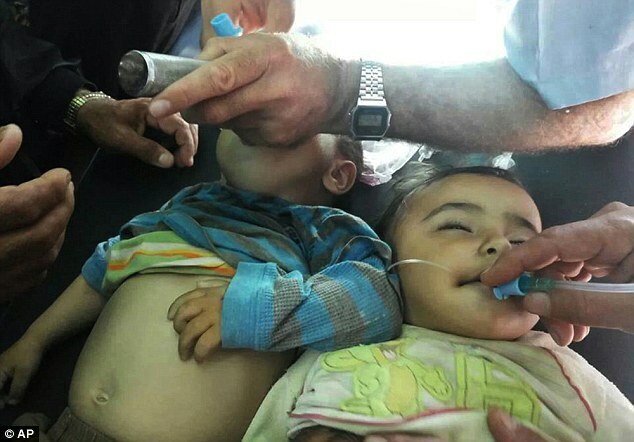 Physicians for Human Rights, a New York-based group that works in rebel-held areas of northwest Syria, sent an internal e-mail saying that up to 50 children may have died from the vaccine. The vaccinations are part of a large-scale campaign to stop the spread of measles, mumps, rubella and polio in rebel-held areas of northern Syria.